Patio fire pits can make your outdoor space into something special. Being able to enjoy the outdoors even when the night is cool is possible when you have a source of heat. And what could be more attractive than a fire pit? 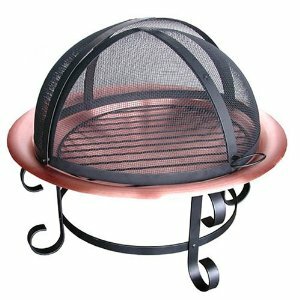 There are many types of patio fire pits to choose from. If your space is limited or you plan to use your fire pit in more than one place, you can choose a lightweight, portable model. If your fire pit, on the other hand, will be a centerpiece in your entertaining area, think about one that is shaped like a bowl or dish. They give the best views from all angles and you and your guests will be able to see and converse with each other over the top. This style is safest when it has a screen cover over the top to prevent sparks from flying out. Another consideration is size. If you want to be able to burn logs suitable for a fireplace, you need a fire pit large enough to accommodate them. It is very important to choose a firm, level surface for your fire pit. A cement slab works exceptionally well. Placing them on wooden decks is not recommended, although that is where many people want to put them. If you must put them on a deck, it is suggested to lay out a large area beneath and surrounding the fire pit with flat concrete tiles to create a fireproof surface. None of these patio fire pits are suitable for using indoors in any location. This includes outdoor areas with overhangs like pergolas, carports, canopies and trees. Before you begin, make sure to follow the construction directions exactly. If you don't, you may find that you have to undo everything you did to go back and add a step you may have missed. Keep up with any maintenance that is required to keep your fire pit in the best condition. For wood burning fire pits, this includes cleaning the ashes out the day after you burn in it. Some models need an occasional coat of paint to keep them looking their best. Don't use just any paint you have lying around; ask at your local paint supplier which paints will work best on the material your fire pit is made from and that can withstand the high temperatures created during use. During the off season, you'll need to store your fire pit. If it will remain outdoors, you may want to cover it to protect it from the elements. Don't cover it up until you know it is completely cool. Even models with lids need to be covered. This little detail can help prevent rust and keep your fire pit in active duty much longer than if you left it to suffer from the elements. Some patio fire pits are set up to use propane or natural gas. They are clean burning and require very little cleaning to keep them looking and performing their best. If you prefer a wood fire, you're not alone. Wood burning fire pits need to be cleaned out periodically to remove the buildup of ash. There are some woods you DO NOT want to burn, including pressure treated wood, railroad ties, and wood that has been painted or stained. These treatments may emit toxins when burned. If you are not sure, err on the side of caution and don't burn it. On the other hand, there are lots of wood you can burn. Eco logs are a commercial compressed fuel made from the dust leftover from manufacturing hardwood floors. These logs are inexpensive to buy and they burn a long time. Cedar is very aromatic when it is burned. It also has the added benefit of keeping mosquitoes at bay. Cedar tends to pop when burning, as oils in the wood heat up and expand. If you are planning on burning cedar, make sure you have a fire pit with a screen securely in place. Mesquite burns very hot, so it is best to only use a piece or two along with other types of wood. It is a good wood to add to barbecues to add flavor. Pinion pine is probably the most common wood used in outdoor fire pits. It smells nice and helps keep the mosquitoes away from your entertaining area. Hickory is also good in the barbecue. It smells great in the fire pit, too. For the best results, only use well-seasoned hickory for burning. Fruit wood like apple, pear and so on smell wonderful in the fire pit. They may be hard to find unless you have some fruit trees of your own. Then you can always use the trimmings in your fire pit. If you have scrap lumber lying around, most of the time it will be fine in a fire pit. Dry pine and spruce burn very hot and fast, so split it into small pieces and use it for kindling. Any wood that is green (uncured) or wet will tend to produce a lot of smoke. This may be annoying to you and any neighbors nearby. It is best to store your wood in a place where it can remain dry. While these safety tips may seem like common sense, it is always good to have a reminder. Always keep a fire extinguisher handy whenever you burn anything. Watch children and pets around a hot fire pit to avoid injuries. Never leave a fire unattended. Ever. Don't touch the outside of a fire pit when it is in use. Don't use water to put out a fire in your fire pit. Do not set your fire pit up on a surface that is flammable, like wood. Always check your surroundings before you begin a fire to avoid fire hazards.